The day before the STS-132 shuttle launch, the NASA folks had arranged a day full of activities for those of us invited to the Tweetup. We spent the morning in an air-conditioned tent, listening to guest speakers, but after lunch we were taken on a tour all around the Kennedy Space Center. One of the places we had the most time was at the Saturn V Center. It’s a huge museum commemorating all the missions that used the Saturn V rocket. As you enter, there’s a fantastic historical video, then you’re escorted into the actual control room they used back in the day. They’ve converted the huge room into a presentation that gives you a good feel for what the excitement level must have been like when they launched those massive rockets. After our group watched the movie, we had about an hour or so to explore the rest of the museum. I wandered alone, reading the plaques, examining the models, and taking pictures of some of the exhibits. 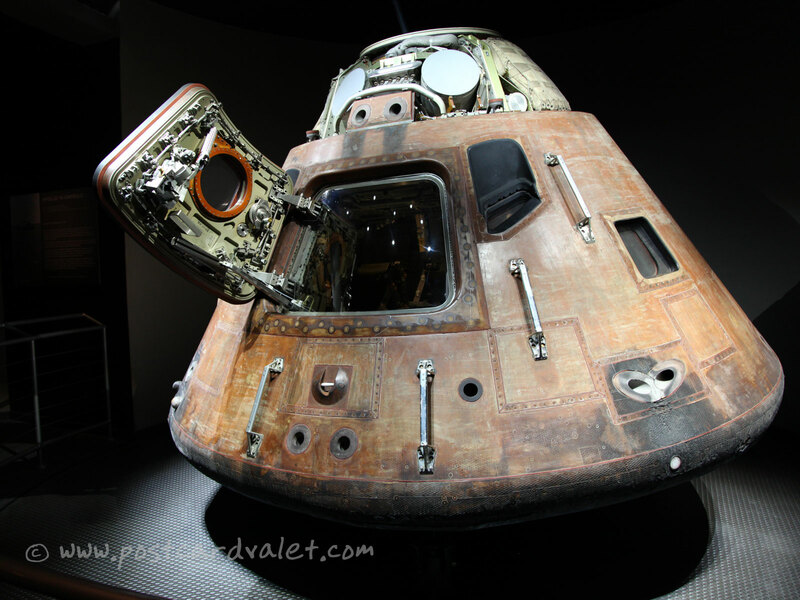 Off in a dark room devoted to the lunar missions, this capsule sat in a roped-off corner. Taking pictures in a museum is usually pretty dull. The lighting is tricky, especially for anything behind glass. I’m sure that someone who’s proficient at studio photography would enjoy artfully capturing these types of exhibits, but not me. Even assuming I’d have the luxury to compose the shots as I’d like, I’d probably just end up with the same photo thousands of other museum-goers took. 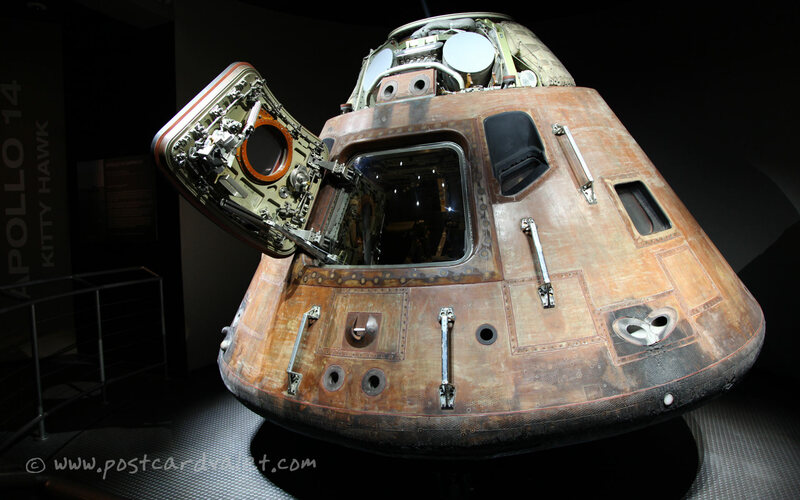 It was with that mindset that I snapped a few photos of the Apollo 14 Command Module. I wasn’t trying for a great picture, just wanted to bring home photos that showed what the Saturn V Center looked like. Like everything else I shot in there, the camera was on the green (automatic) mode. I didn’t see the photos until I got back to the hotel, but I was immediately struck by this one. I love the lighting with the module illuminated and the rest of the corner swimming in darkness. The camera did a good job exposing, of course; all I did was push a button, but whoever designed the exhibit for the “Kitty Hawk” deserves credit, too. Also, as a side note, I have to say: Even at ISO 1250, the Canon 5D can take some remarkably noise-free photos!